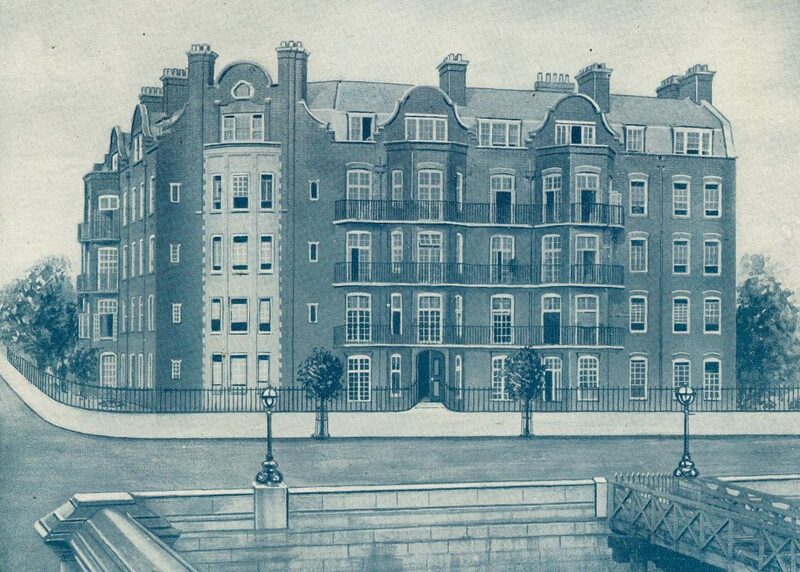 When driving, cycling, walking, and even passing by in a boat, it’s difficult not to spot the mansion block, More’s Garden, in prime position on Cheyne Walk in Chelsea. Situated by Battersea Bridge with views over the River Thames, More’s Garden was constructed in 1904 on the site of the former gardens belonging to Sir Thomas More. 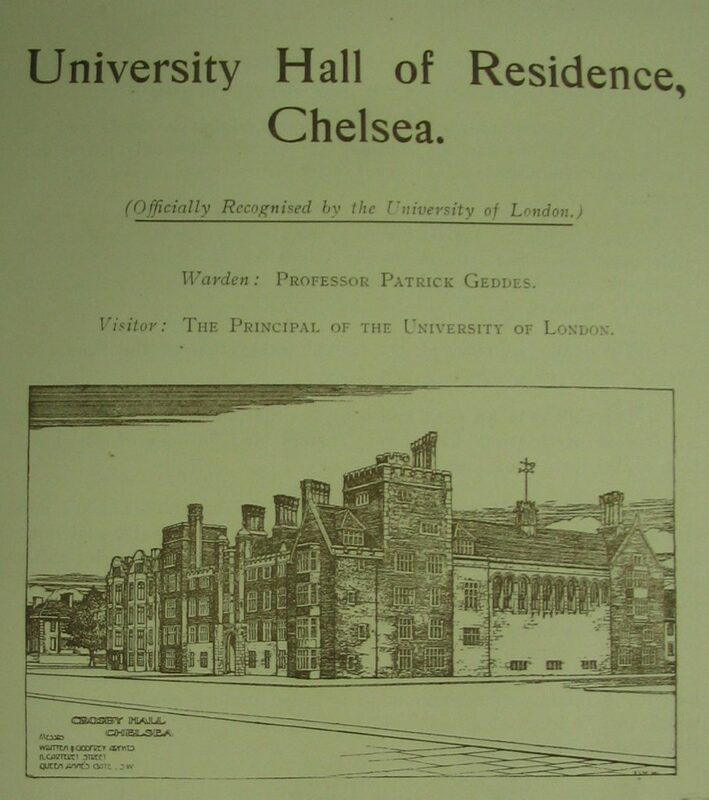 Flats were advertised for More’s Garden from 1903, but unusually by 1908 it was being used for student rooms for the University of London. Henry VIII’s Lord Chancellor, Sir Thomas More, moved to riverside Chelsea during the 1520s when he had a large house in open fields with extensive gardens a short distance from the river. The house later became known as Beaufort House (and where the name Beaufort Street originates). Many years later the riverside had been transformed into a busy dock, but with the development of Chelsea Embankment from the 1870s, large sections of the eastern stretch of Cheyne Walk opened up for redevelopment. However, despite the highly prized riverside position we admire today, by the turn of the 20th century, the corner site of Beaufort Street still lay vacant. 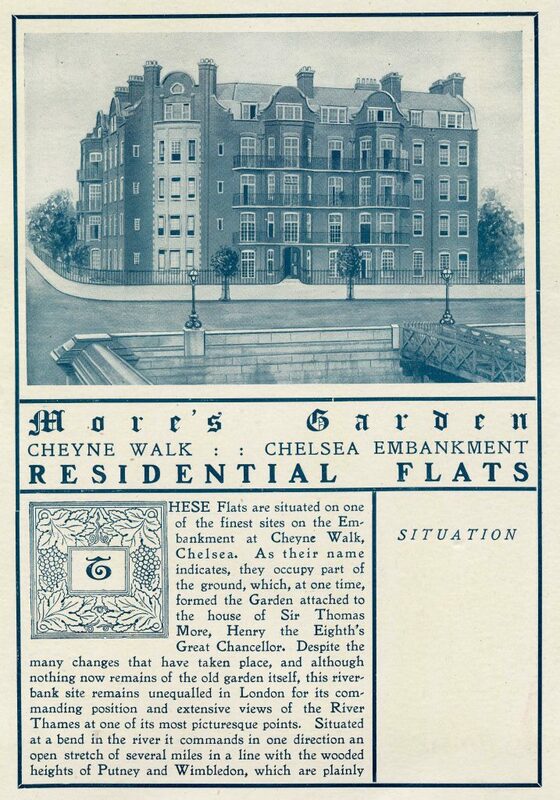 Original plans for the new mansion block were submitted in October 1902 under the name of ‘Cheyne Towers’, but by the time construction was under way in 1903 the new residential block had been renamed ‘More’s Garden’ – an acknowledgement to the site of the gardens of Sir Thomas More. Original sales particulars from 1903 reveal the block was planned as residential apartments, with the most up-to-date conveniences for modern Edwardian living. These included, ‘hot water from a supply boiler in the basement…tenants will thus be saved the expense and trouble involved by kitchen fires at all seasons of the year and throughout the day…’ There was also hot water radiators in the entrance hall to each house, along with electric lighting (when many people still relied on gas) along with an electric passenger lift. An optional extra was the connection of a telephone allowing tenants ‘to communicate with any part of town, and could instantly speak with the caretaker’. By July 1905 an advertisement in The Times reveals the flats were ready for new tenants at an annual cost of £180-£200. However, by 1907 things took a different turn when Nos. 2-5 More’s Garden were acquired by ‘The University and City Association of London’, who were closely linked with plans for the neighbouring Crosby Hall. They officially opened More’s Garden as a University Hall of Residence in December 1907, starting with an initial 10 students, and increasing to 25 by 1910. At the same time, the University and City Association were campaigning for the relocation and preservation of the medieval Crosby Hall, which had formerly been located in Bishopgate. The aims of the association were to save the historic hall, originally built in 1466 and has been called, ‘the most important surviving domestic Medieval building in London’, but also to create a collegiate environment, similar to those in Oxford and Cambridge, for students in London. Crosby Hall was to be the centrepiece of this new academic environment by the banks of the Thames, with More’s Garden one of the associated buildings. 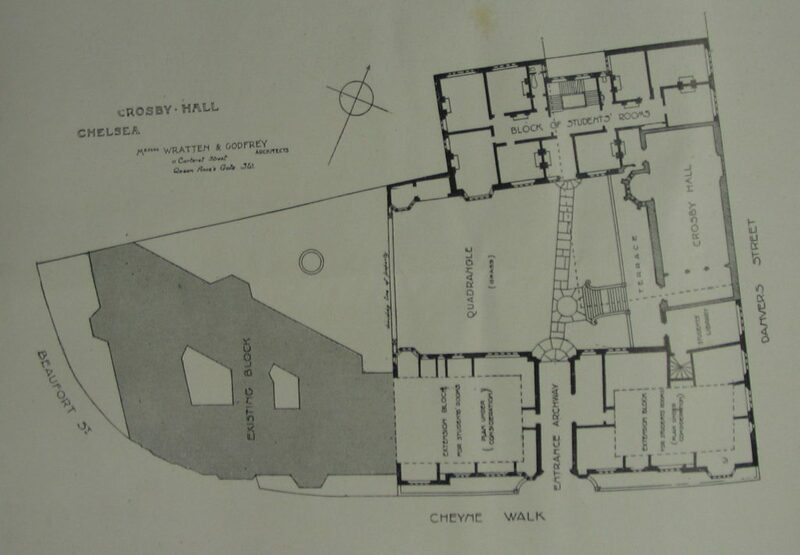 The campaign to relocate Crosby Hall was a success and it was moved piece by piece from the City to Chelsea in 1910. However, the plans of the University and City Association to create an college environment did not eventuate. Part of the reason for this was the onset of the First World War in 1914, which took away much of the funding. 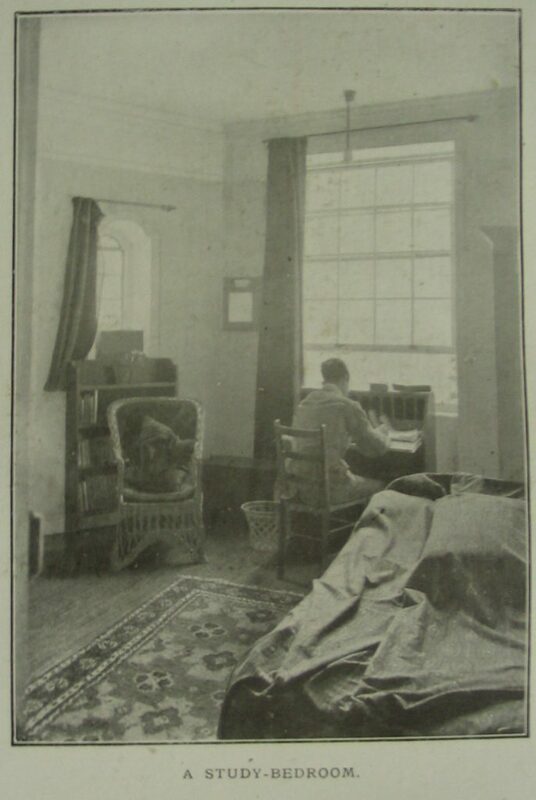 In fact, Crosby Hall was used as temporary accommodation for Belgian refugees during the war. Today, Crosby Hall is a private residence, the home of businessman and entrepreneur, Christopher Moran. It was also during the war that the students left More’s Garden and it once again became available as residential flats for private tenants. The flats were empty in 1915, but the parish rate book reveals new tenants moved in during late 1915 and early 1916. By this time, the annual rent was £175. Since the early 1900s, More’s Garden has continued as residential flats and has been home to many notable residents, including novelist and playwright, Charles Langbridge Morgan, along with his wife, also a writer, Hilda Vaughan. The block has also been the home of Olympian rower, Stephen Ian Fairbairn; photographer and astronomer, Margaret Lindsay Huggins; Captain Edward George Hastings of the Royal Navy, OBE; and British Ambassador, Sir Owen St Clair O’Malley. 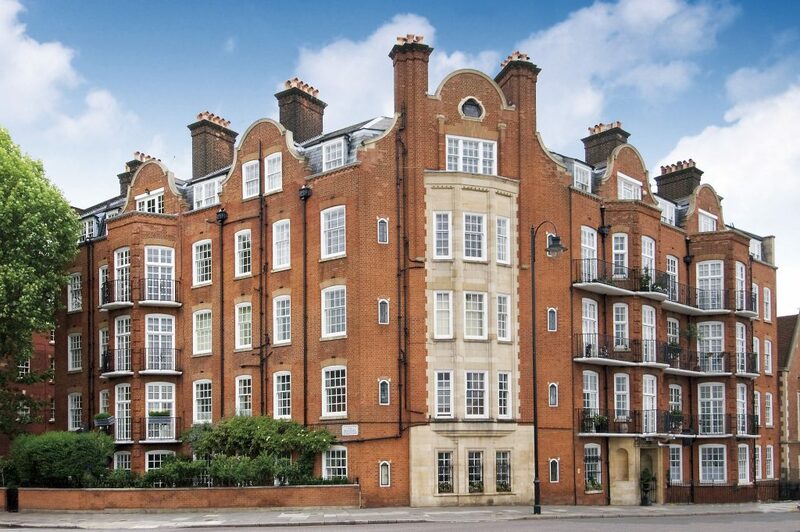 Today, More’s Garden continues as a highly sought after residential mansion block in an historic corner of Chelsea with beautiful views over the River Thames.